Consumer prices moved higher in August, a sign that U.S. inflation may be continuing to firm after years of sluggish price growth. There can only be an “inflation problem”, by which it is meant that inflation is on a rising trend, if NGDP growth is also on a rising trend. The charts illustrate. I use the PCEPI because that´s what the Fed targets, but the picture for the CPI would be the same. From the mid-1960s to the late 1970s, rising inflation (a rise in all prices, both headline and core) was made possible by a rising growth in nominal spending (NGDP). To bring inflation down, a reduction in NGDP growth was necessary. Since then, relative stable NGDP growth was consistent with relatively stable inflation. It is important to understand that a rise (fall) in oil prices or, for that matter in any of the components of the price level (shelter, health, etc.) does not mean that inflation will rise (fall). It simply means that a relative price change is taking place. If NGDP growth is stable, so will inflation. The Great Recession was defined by negative NGDP growth. Inflation drpped significantly. 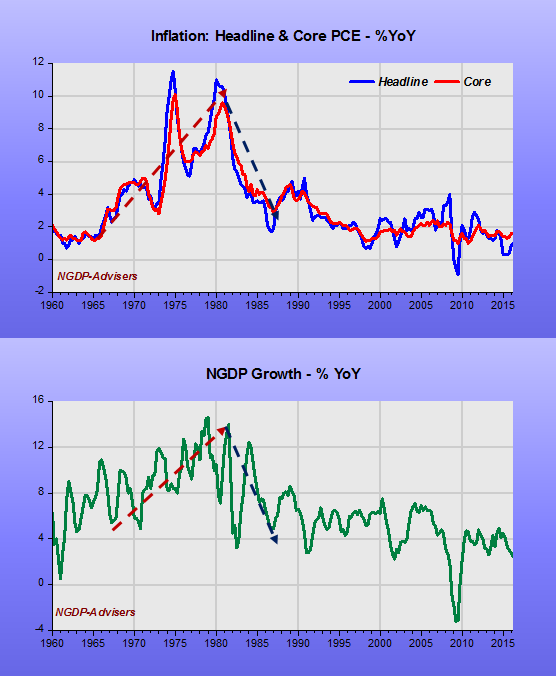 Since then, NGDP growth has been relatively stable at a relatively low positive growth rate. So it´s not surprising that inflation has also been stable at a relatively low (below target) rate. And so it will remain, especially because it appears that NGDP growth is being brought down even lower.